"Relax and Rejuvenate with French Oasis Holidays"
We welcome you to Le Prince Noir, holiday rental in Southern France .... an oasis in the heart of the vineyards of the Dordogne, France, just 20 kms South of Bergerac. Here you can follow your own plan, rest, relax and decide yourself how you spend your holiday. • Just bring your holiday spirit, not the kitchen sink! Le Prince Noir was originally a farm, built over 200 years ago in the style typical of the Perigord, with walls of golden sun-bleached limestone. 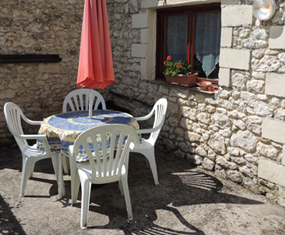 The farmhouse and the two gîtes are quietly situated on top of a small hill, with panoramic views of the rolling hills of Dordogne. At Le Prince Noir we have done our best to provide you with an independent holiday that is relaxing in every way. Enjoy slowing down to the French pace of life. We live on site, discreetly separate from our guests – happy to give you help and advice should you need it. 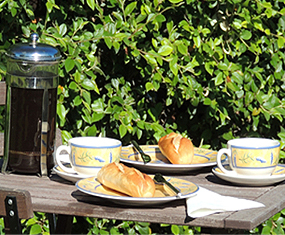 We are just on the edge of the small village of Fonroque - only a five minute walk in the morning to get your warm croissants for breakfast, from the boulangerie (bakery). 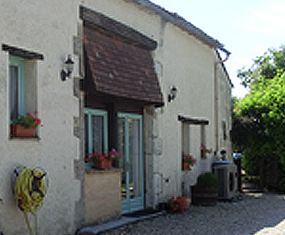 The village also has a small grocery shop and a café – ideal for a light lunch, or stopping for a cool drink. A French village that still has a ‘heart’ – you may even get the chance to join in the village meals in Fonroque, which take place during the summer months in the square. Those looking for more activity will find the lovely bastide town of Eymet is just 4 kms away offering a range of shops, restaurants and bars. It’s a thriving centre especially on market days, with a popular evening market during the summer months. The historical city of Bergerac with a wealth of cultural events on offer during the summer months, is only 20minutes drive away.